If you regularly use your towbar and think the design of your car is very important, a detachable towbar is the perfect solution. There are three types of detachable towbars: horizontal, diagonal and vertical detachable towbars. We are happy to list the various similarities and differences between the different detachable systems. All detachable towbars are innovative versions of the fixed towbar. You no longer have a permanently visible towbar on your car, but at the same time, you always have one handy when you need it. The hook and ball sticking out from behind your bumper, called a tow ball, can be removed. After the tow ball is removed, the original design of the car remains as intended. Therefore, choosing a detachable towbar constitutes an elegant solution. For all types of detachable towbars, the ball can be manually placed and removed extremely easily. It only takes a handful of seconds and a few clicks. You won’t get your hands dirty, as no tools, lubrication or grease are required to lock or unlock the ball. The clip below shows the BMA, the diagonal detachable towbar. Further down this page, there is a clip of the vertical detachable towbar, the BMU. The construction component of your towbar is mounted to the chassis of your car behind the bumper. This construction component is equipped with a sleeve where the detachable ball can be locked and unlocked. A cover cap is provided with all detachable towbars to cover this sleeve. You can place this in the sleeve after the tow ball is unlocked. This prevents dirt from accumulating in the sleeve. Your boot lid is better accessible with a detachable towbar. Because of this, it is easier to load your boot, as there’s no towbar in the way during loading and unloading. A storage bag is supplied with all detachable towbars. This ensures you can store the towbar in your car without leaving dirt. 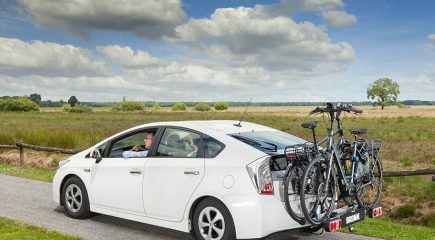 After placement, the horizontal, diagonal and vertical towbars are all optimally prepared for the burden of both bike carriers (vertical load) and trailers, caravans, boat trailers and horseboxes (horizontal load). They offer the same strength and security as a fixed towbar and have been tested at maximum values, as reported by car manufacturers. A leeway has been integrated at the end of the ball in all detachable systems. This extendable metal consists of two separate parts that are connected and snap in place in the ball. This ensures that the pressure is not applied to the end, where the ball is clamped in the sleeve, preventing the risk of leeway of the ball in the sleeve and ensuring the ball remains in stable position. All detachable towbars are protected against theft. The ball has a permanent safety lock with a key. You can use this at the times you decide to leave the ball in the sleeve. If you are walking around the vehicle, the sleeve of a horizontal detachable towbar is completely visible under the bumper, the sleeve of the diagonal detachable towbar is partially visible and the sleeve of the vertical detachable towbar is completely invisible. The socket of the diagonal and vertical detachable towbars can always be folded out of sight behind the bumper. With the horizontal detachable towbar, this depends on the design of the car. The sleeve of the horizontal and diagonal detachable towbars is completely accessible. Simply bending over is enough to lock and unlock the ball, as the sleeve is partially or completely visible under the bumper in both systems. Since the sleeve of the vertical detachable towbar is hidden behind the bumper you will have to go down on your knees to lock and unlock this system. The horizontal detachable towbar has a sliding mechanism to lock and unlock the ball. This is different from the diagonal and vertical detachable towbar, which can be operated with a dial. This dial has arrows that show the two consecutive actions needed for unlocking the system. The turn direction of the dial differs in both systems. In the vertical detachable towbar, the dial has to be turned up, while in the diagonal detachable towbar the dial has to be turned down. The benefit of the downward turn is that your hand turns away from the bumper. This ensures there is more room for your hand between the bumper and the dial, in order to effortlessly unlock the system. 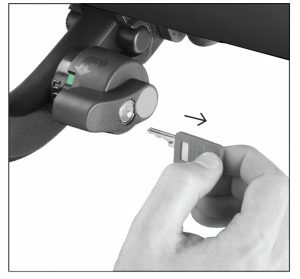 The lock of the diagonal and vertical detachable towbars is very audible. You will hear a click as confirmation that your ball has been locked properly. The horizontal detachable towbar is not equipped with this audible locking system. The lock of the diagonal and vertical detachable towbars is easy to see. The dial of both systems has a built-in colour indication consisting of colour codes. Green means a successful lock, red indicates a new attempt is required. The horizontal detachable towbar is not equipped with this visible locking system. Read more about the detachable towbar.